I love this recipe. 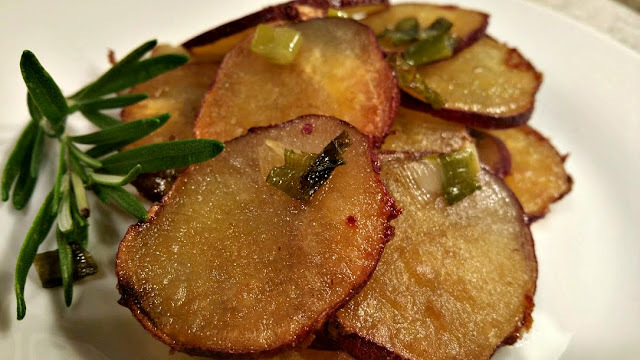 Traditionally, Pommes Anna is made with potatoes, butter, salt, and pepper. Four perfect ingredients resulting in a delicious dish to serve alongside roast chicken or beef and sauteed greens. Or, as a breakfast or brunch item topped with a poached egg. Sometimes I make a large green salad and serve with a wedge of the Pommes Anna sprinkled with a nice handful of shredded Parmigiano-Reggiano. Perfect for brunch, lunch or a light supper. Today I used sweet potatoes in place of the more typical potatoes, and the results were delicious. I combined chile-infused olive oil with the butter for a bit of heat and added green onions, rosemary, and fresh thyme. I used Japanese sweet potatoes which have a deep purple skin and creamy white flesh. The more typical variety will result in a golden orange color. Both so very beautiful. 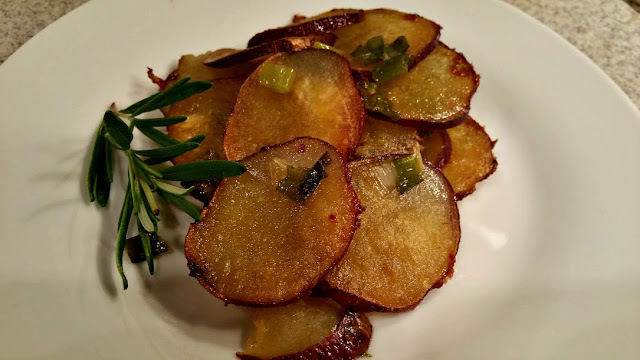 The sweetness of these potatoes combined with the spice from the chile oil and the caramelized onions makes this a dish I will serve all fall and winter. Is it too early to begin planning Thanksgiving dinner? The skillet is flipped after cooking, so the bottom becomes the top. This results in a beautiful dark caramelized top with crispy sweet potatoes and a soft, melt-in-your-mouth center. Try these sweet potatoes. You will be very happy. 3 sweet potatoes (about 3 pounds total) scrubbed and unpeeled. Add 1 tablespoon butter, the olive oil, flour, a teaspoon each sea salt and pepper (and chili flakes if using) into a large bowl. Microwave for 60 seconds or until butter is melted. Add sliced sweet potatoes and stir until all potatoes are coated with the butter/olive oil mixture. Add 2 tablespoons butter into a 9 inch cast iron skillet. Place skillet in preheated oven for 2-3 minutes, or until butter is melted. 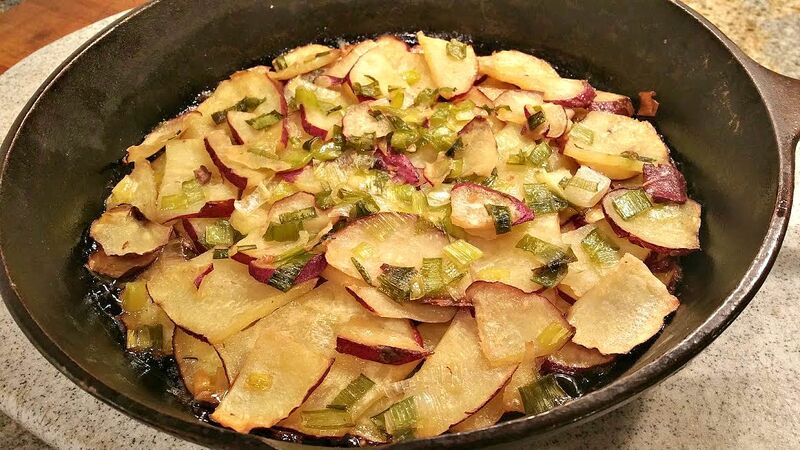 Place the potatoes in overlapping, concentric circles until the bottom of the skillet is covered. Sprinkle some of the onion and herbs over the top. Repeat these two steps until all of the ingredients are used. Cover skillet with foil and place an oven safe plate on top of the foil to weigh down the potatoes. *Note, the plate must be smaller than the diameter of the skillet, so it rests directly on top of the potatoes...not as a cover for the pan. Bake in preheated oven for 30 minutes. Remove plate and foil and bake for an additional 20-30 minutes or until the sweet potatoes in the center of the skillet can be easily pierced with a sharp knife and the top is golden brown and crispy. Remove from oven and allow to rest for 15 minutes. Place a plate over the skillet, flip and remove the skillet. The galette should be resting on the plate. If not, run a sharp knife around the edge of the skillet and try again. To serve, you can cut the galette into wedges or, do what I do and use a spoon to scoop out each portion. I like this technique because the potato rounds are emphasized, and I think it looks prettier. Either way works. It is Sweet Potato week at Food Network's Fall Fest roundup. Do you have a favorite sweet potato recipe to share? Please list (or link) in the comments below. And be sure to check out the other delicious sounding recipes from my blogger friends and Food Network. I am part of a group hosting a "scotch tasting party" in November. This was a silent auction item at a fundraiser for our local food pantry. The other hosts are contributing the scotch. I have the task of creating an appetizer menu to pair with each scotch offering. Yikes! Food and scotch? This should be interesting. I am still working on the savory items...but dessert? That one is in the bag. 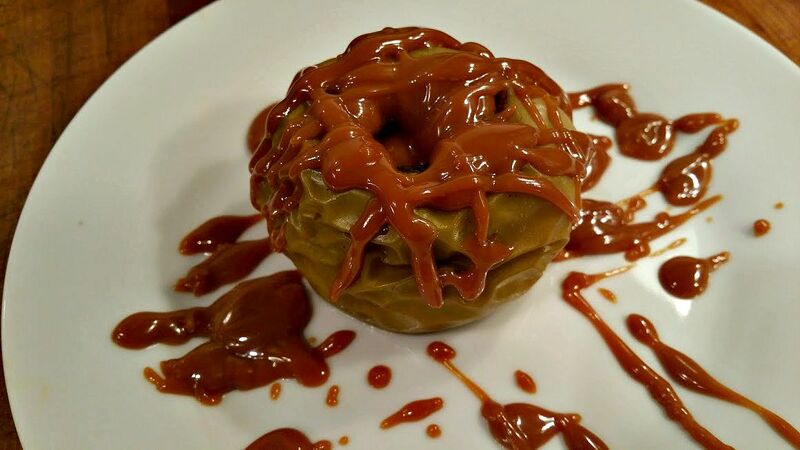 I loved caramel apples as a kid. Still do. It is my guilty fall snack. I make a big batch of caramel and then dip sliced apples into the deliciousness. Not very healthy, I admit. But, once in a while, a very welcome treat. There is something so magical about combining apples and caramel sauce. For the party, I decided that a bit of spice and a shot of the aforementioned scotch would add a grownup component to my childhood treat. 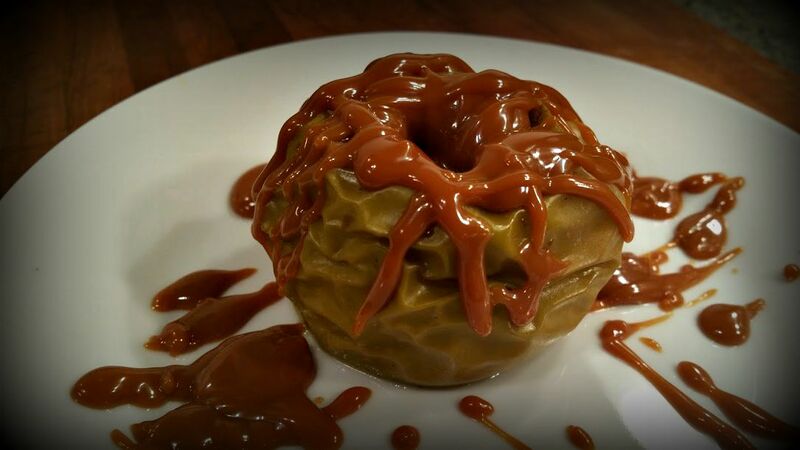 So... "Grownup Caramel Apples" were born. I baked apples filled with coconut sugar, honey, spices and extra virgin olive oil and then drizzled lots of warm dulce de leche sauce spiked with a bit of scotch. My husband and I did a taste test in preparation for the party. I won't admit to how fast we devoured every bite. A shot of scotch with the apples was the perfect finish to the day. This recipe is a keeper and will be a welcome addition to our Thanksgiving dessert table. Enjoy! 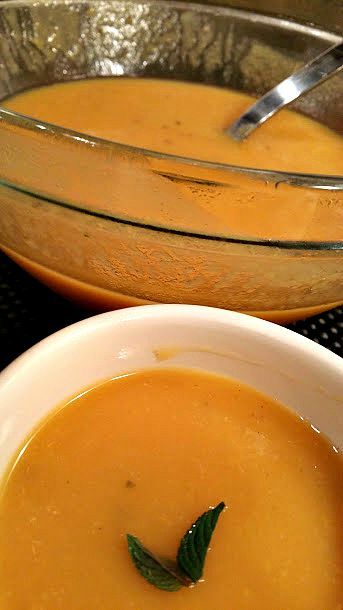 2 cups dulce de leche sauce (homemade) or best quality purchased. I use this brand. Preheat oven to 350 degrees. Grease rimmed baking pan with olive oil. 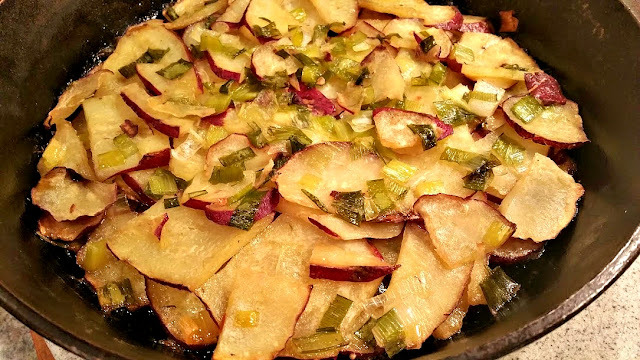 Core apples and place in prepared pan. Drizzle olive oil in the center of each apple and along the tops. Drizzle honey equally in the center of each apple. (Heat honey in microwave for a few seconds if necessary to make it pourable). In a small bowl, mix together the sugar, allspice, cinnamon and sea salt. Sprinkle equally in the center of each apple. Cover the pan with foil and bake in preheated oven for 1 hour, or until the apples just easily pierce with a sharp knife. 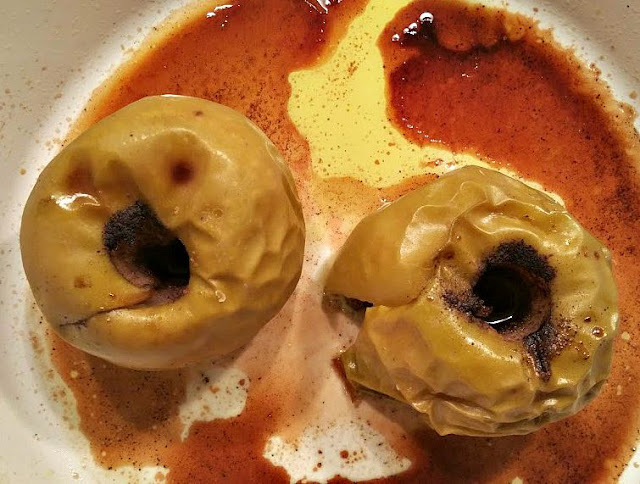 Do not overcook the apples, you want a bit of texture. Remove from oven and place apples on serving plates. Drizzle some of the pan juices over each apple. 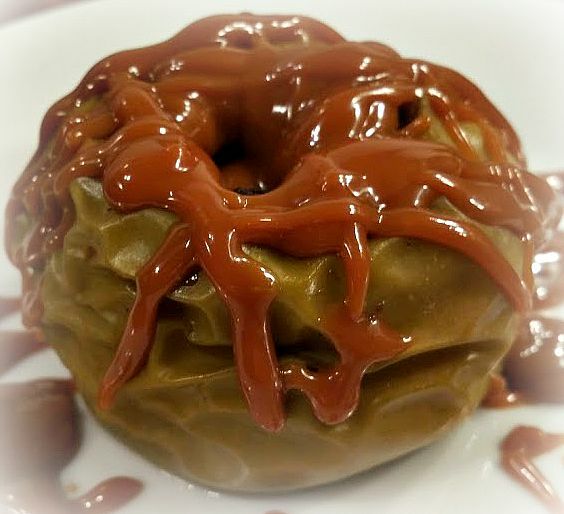 Place dulce de leche in a microwave safe bowl and heat, in 10-second increments, until soft and very pourable. Quickly stir in the Scotch and salt. Drizzle into the center of apples and along the top. Serve immediately. Note...you could serve this with vanilla ice cream, but I don't think it works for the scotch tasting party. I love it as is. It is Apple week at Food Network's Fall Fest roundup. Do you have a favorite apple recipe to share? Please list (or link) in the comments below. And be sure to check out the other delicious sounding recipes from my blogger friends and Food Network. I had such a hard time naming this soup. Peach needs to be in the title, of course, but Chilled? Spiced? Boozey? Sweet? Dessert? Appetizer? I narrowed it down, but it really should include all of the previous descriptions. Bottom line, just call the soup delicious. My friend Elizabeth's peach tree was loaded this year. She gave me a huge bag last week, and I have been making peach dishes daily...as well as eating fresh peaches whenever I can. 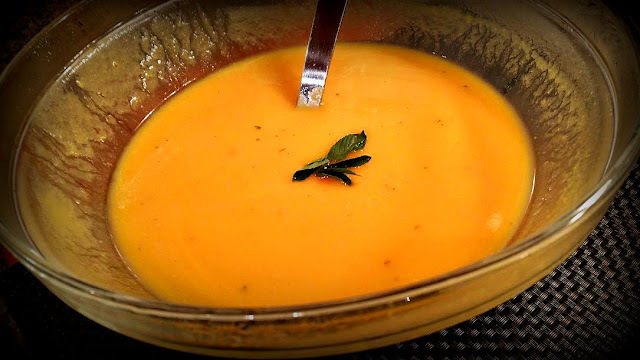 I am a fan of chilled fruit soup and thought a blend of peaches, spices, and bourbon would be a good combo. I loved the finished result and everyone who tasted gave the soup high marks. We agreed that the recipe would be perfect as an appetizer OR dessert. Without the bourbon, delicious for breakfast (booze in for brunch...yes?) Welcome to fall, everyone! Place peaches, coconut milk, water, 2 tbsp honey, allspice and sea salt in a medium sized saucepan. 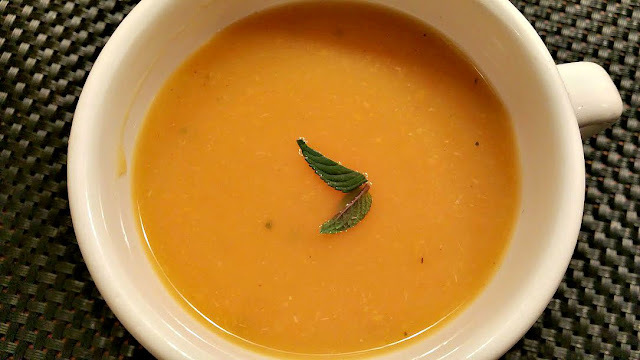 Heat to high-simmer (do not let boil), reduce heat to low and simmer for 15 minutes or until peaches are very soft. Remove from heat and allow to cool slightly. Carefully add peach mixture to a blender. Add the bourbon and chopped mint leaves. Blend until the soup is very smooth. Pour into a large bowl and refrigerate until very cold. When ready to serve, remove from refrigerator, taste and adjust seasonings (honey, salt, allspice and/or bourbon if desired.) Serve in small bowls garnished with fresh mint leaves. It is Soup week at Food Network's Fall Fest roundup. 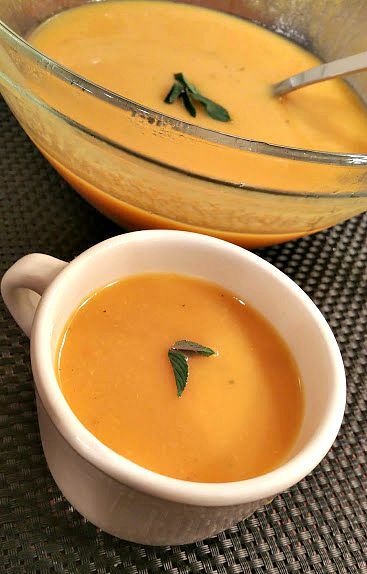 Do you have a favorite soup recipe to share? Please list (or link) in the comments below. And be sure to check out the other delicious sounding recipes from my blogger friends and Food Network. 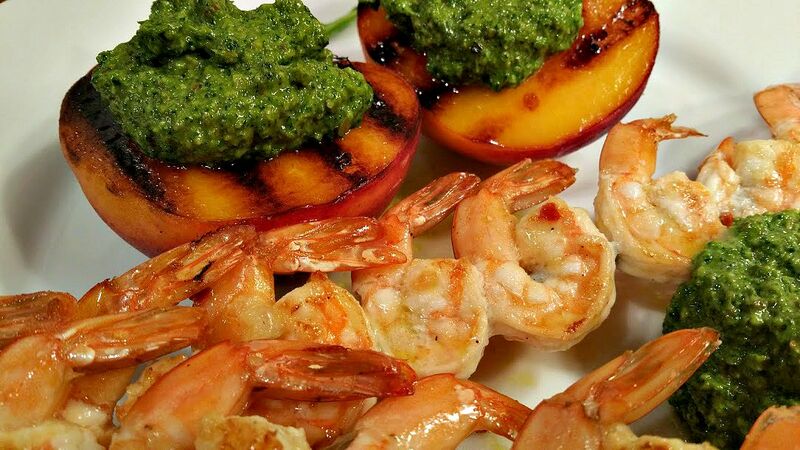 I was watching a cooking show on Food Network last weekend and saw Bobby Flay create a dish of grilled peaches with arugula pesto. It looked and sounded so delicious that I decided to create my own version and serve with grilled shrimp. The verdict? A MAZ ING. 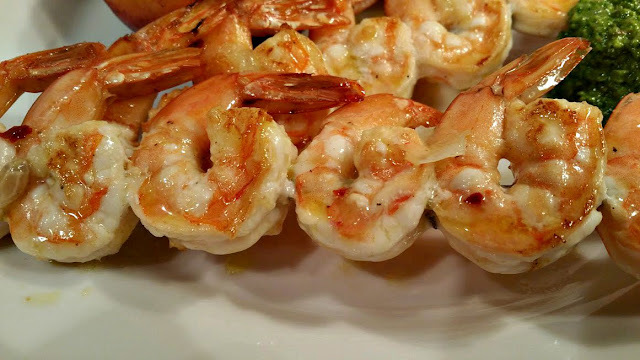 The shrimp is marinated in a mixture of fresh lemon juice, olive oil, and spices then grilled until just cooked through. The peaches grill alongside the shrimp creating a caramelized top crust. My pesto is different from Bobby Flay's. Mine follows the steps of the classic but uses the spicy green arugula, a bit of basil, almonds, spices, Parmigiano-Reggiano and I added a touch of balsamic vinegar to sweeten and smooth the arugula's bite. 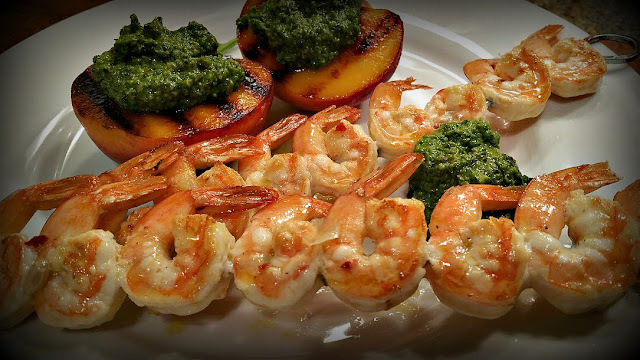 Really good with the peaches and shrimp, the leftover pesto can be spread on roast beef or chicken sandwiches, topping pizza, stirred into steamed or grilled vegetables or thinned with additional olive oil and vinegar and used as a salad dressing. Enjoy for your Labor Day BBQ or anytime fresh peaches are in season. Place shrimp in medium bowl. In a small bowl, whisk together lemon juice, 1/4 cup olive oil, red pepper flakes and a pinch each salt and pepper. Pour over shrimp and allow to marinate a minimum of 1 hour. Place peaches flesh side down on the grill. Place shrimp skewers on grill. Cook for 1 minute and flip skewers. Cook for another minute or two removing as soon as shrimp turn from gray to pink. Remove peaches and shrimp from the grill. To serve, Place 2 grilled peach halves on each plate. Divide shrimp equally and fill peach centers with a scoop of arugula pesto. Serve additional pesto on the side. Place cheese in the bowl of a food processor and pulse until grated. Add arugula, basil, garlic and almonds and pulse for 30 seconds. With machine running, slowly pour in 1/2 cup olive oil and process until smooth. Add the balsamic vinegar, pepper flakes and a pinch each salt & pepper. With machine running, slowly add additional olive oil until you reach your desired consistency. Taste and adjust seasonings if necessary. To store, pour a thin layer of olive oil over the top of the pesto. Cover with plastic wrap, pressing it into the top of the pesto. Store in the refrigerator for up to 2 days. Summer means easy, breezy dishes made from fresh, just-picked produce and this week at Food Network's Summer Soiree we are celebrating Labor Day. Do you have a favorite Labor Day recipe? Share in the comments section and/or link to your blog if you have one. And be sure to check out the delicious sounding recipes from my blogger friends and Food Network.